Day 7 saw me fly from the high cliffs of the Dolomites out to the Mediterranean air of Lago di Garda (the Monte Baldo turn point 5), and back into the deep mountains with the epic ridges and green lichen rock slabs of the Adamello massif. It was a classic X-Alps day with a variety of challenges and obstacles – time urgency ahead of building valley winds, scraping into land just above the bush line, delicate flying in some sections and just holding on in others, a beautifully stratified airmass and spectacular storms not so distant. During the night or early morning a storm passed, and we woke up to heavy dew and fog. Otherwise it was a blue and sunny day, perfect for an early start on the Brenta massif. It happened so many times this race that, despite my preference for exploring new terrain, I would find myself in the exact same position as two years earlier. However I lost the footage last time so the revisit was welcome. Ben and Mum drove to the road end and walked up the last part with me to launch. Early on the conditions were weak but I ahead of me were irresistible cliffs, and it only got better. As I cruised past the Brenta massif I kept a keen eye on the lakes, watching for any signs of a building valley breeze. I took a final climb and a long glide before an intricate section of flying beneath the inversion, with cliffs and a lot of shrubs and leafy trees. Flying as fast as I could I dangerously low, and I took a spur of the moment decision to land while I was marginally above bush line. The conditions weren’t better on the other side and I launched in the same place, but maybe it was during a better thermic cycle though. I was nervous that while everything was going well so far, I could easily botch things up, “there’s always plenty of chances to make an idiot of yourself in the xalps”. I got a pleasant reception at the turn point (sensibly located at altitude, this time) after racing up on foot. A young girl handed me a cold bottle of water and local pilots offered their help. I took off and crossed the lake again with a noticeable increase in the valley wind, but nothing exceptional. This time I climbed on windward cliffs but still snuck over into the lee as I ascended over the summit. Further down the course I chased Seb (GER1), who had been delayed after crossing the lake too early that morning. There was some big air as we approached the Adamello massif. It was one of the most picturesque moments of the race when I climbed high before pushing over the critical pass. Beneath me shattered lichen covered granite, green valleys, and glaciers, and a juxtaposition of airmasses – valley inversions, humid clouds lapping against the ridge, and building storms. The pass crossing as always was very close, and another highlight. It enabled me to stay high whereas the GER1 route further south punished him with a long descent into the valley. After I did my best to stay high as humid air lapped up against the towering rocky peaks. 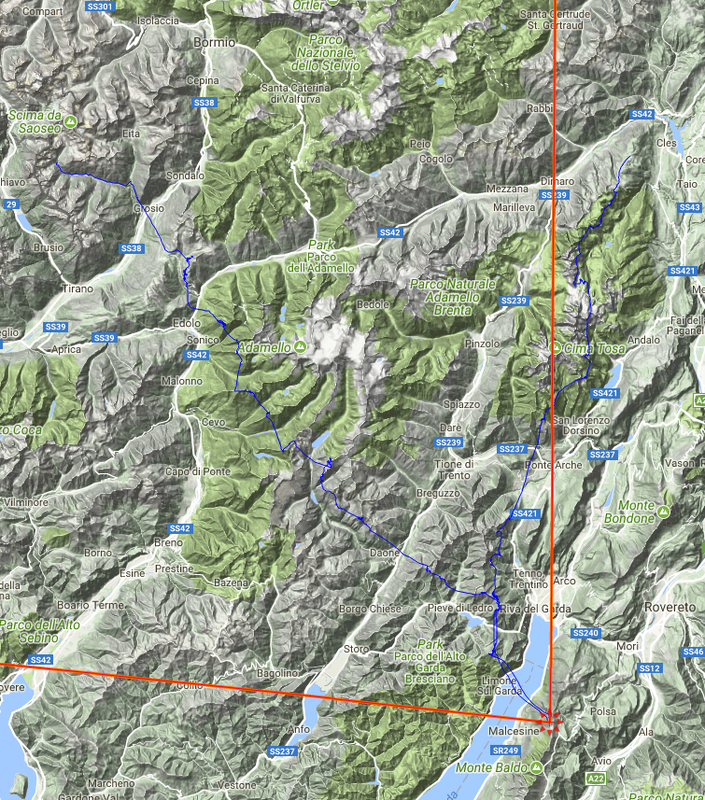 At one point I thought of pushing west early, which is the route that Paul (AUT1) took. I never really intended to push far north into the mountains but as events transpired I thought it was my best chance of staying up. This was after getting stuck in a side valley working weak lift for as long as I needed to for another skin of my teeth exit. Unfortunately after crossing the Adda I found the valley had been flushed by outflow from storms to the north. Having said that it was great to land high and I would do anything to avoid highway bashing. I’m always up for the high risk high return option, especially if it’s along an interesting route in the high mountains. But ironically it had happened again – I’d followed the 2015 route despite the turn point no longer existing! As the evening drew out a storm lashed out and in the darkness I reached a pension full of screaming holiday kids and warm Italian hospitality. Mum was dead tired but ever so keen to help, Ben and I had a bit of a chat and swapped stories, while we reassured fretting relatives that we were comfortable and on top of things. could have done a little bit better than that, but..
but just got this climb. big country! Have I said that before today? oh, I think I might be through! oh my goodness – why is it always so god-dammed close! really interesting how there’s cloud at different levels.